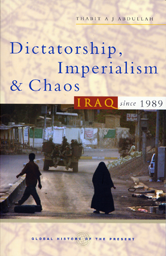 This book is a concise, readable, yet rigorous narrative of the recent history of Iraq. It focuses on the transformations within the country, placing the people of Iraq at the centre of the changes which began with the invasion of Kuwait in 1990, and ended with the current American occupation. The book tells the story of the country in order, but detours to explore themes such as the role of oil, the nature of Saddam Hussainï¿½s state, the social impact of sanctions, the roots of sectarian divisions, and the question of the ï¿½artificialityï¿½ of Iraqï¿½s borders. Concluding with a critical look at simplistic notions of Iraqi social divisions it argues that there is a basis for national unity which might yet bring the country out of its current crisis.